Ashby Clippesby mill is one of the older mills, being originally built with older type narrow bricks before being heightened to 41 ft to the top of its cap, using a more modern style of wider brick, possibly in 1814. 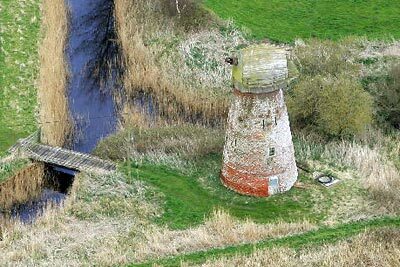 The mill had a Norfolk boat shaped cap with a petticoat and gallery. 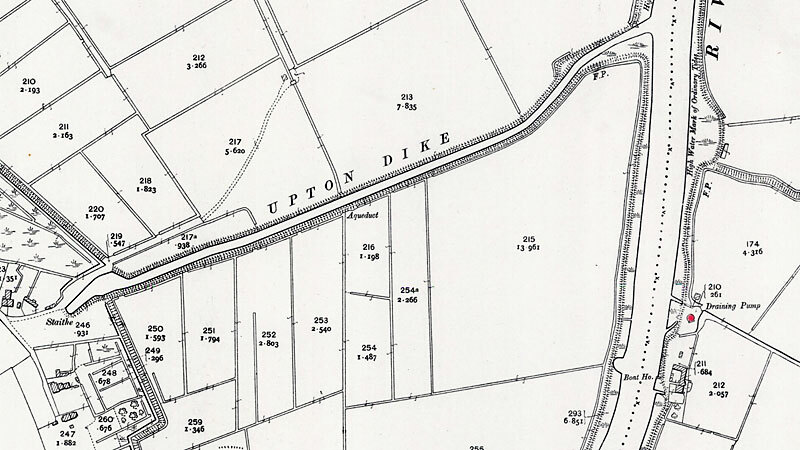 By the 1970s a modern brick pumphouse had been built close by to take over the work of the mill. 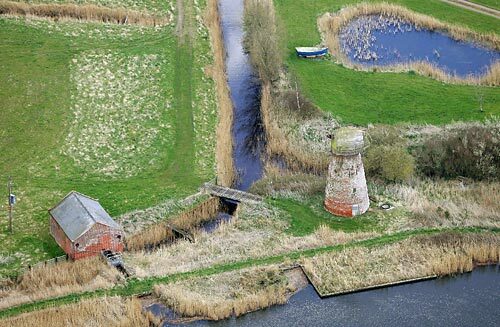 Clippesby Mill does not have the appearance of a converted mill, with its sturdy red brick tower still supporting a boat cap, windshaft and internal machinery. 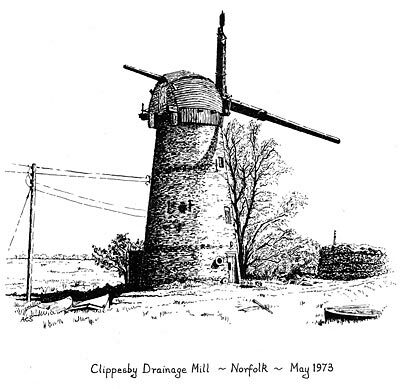 As another example of a mill still standing the following description of Clippesby Mill on the River Bure, given to me by Vincent Pargeter, is of particular interest. The mill has four storeys and is 41 feet high to the top of the cap, with an overall base diameter of approximately 21 feet and 13 feet diameter at the top of the tower below the cap: there are two opposite doors and a window at each storey except for the top one. Vincent says, 'The mill has obviously been lived in during its working life, and has a bricked-up fireplace on the ground floor opposite the scoop wheel shaft exit arch. The ceiling of the first floor was plastered as small remnants testify. There are also small cavities in the wall low down which suggests built-in bunks or settees lining about half way round. It is also evident from cavities in the wall that there was once a staircase from the ground floor to the first floor, but this has later been replaced by a ladder ... The mill is an old one, and we have found the date 1814 carved in the brickwork inside. This may not be the date of the building, as the oldest part of the mill is is built of thin bricks, and the walls are 3 feet thick up to waist height on the ground floor. The tower has been heightened by about 8 feet with thicker bricks, but this is not very noticeable from the outside, as the batter of old and new work are nearly the same. 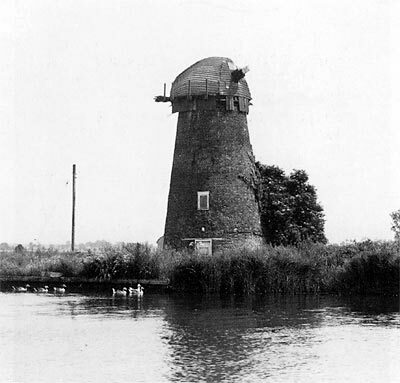 The mill still has windshaft, clasp-arm wooden brake wheel, all cast-iron wallower, one piece pine upright shaft, all cast-iron crown wheel with spur teeth. The pit wheel and wheel shaft have gone. There was a scoop wheel to the last, but this has now gone ... 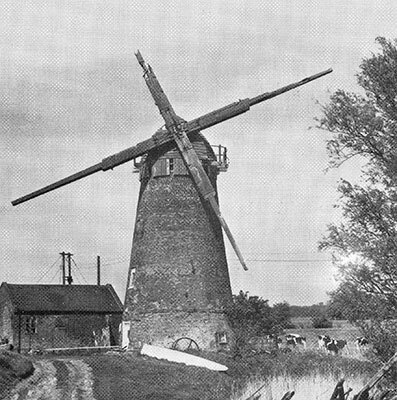 The mill was converted as a weekend retreat in 1958 , but in 'spartan' manner.